FROM CW1 AREA ( NEAR CREWE CHESHIRE). 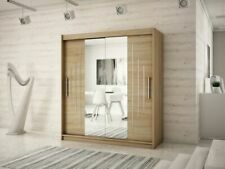 Modern Oak Effect 2 Door Wardrobe With Drawers. COLLECTION ONLY. ORDERS RECEIVED BY 3pm DISPATCHED SAME DAY - OVERNIGHT! New listing SOLID OAK RUSTIC DOUBLE WARDROBE WITH 1 DRAWER &HANGING RAIL RUSTIC FINISH!! SOLID OAK RUSTIC DOUBLE WARDROBE WITH ONE DEEP DRAWER AND A HANGING RAIL. TONGUE&GROOVED BACK PANEL AND DRAWER BASE. TOP ROB SECTION AND BOTTOM DRAWER SECTION OR TOP ROB SECTION CAN BE DISMANTLED. HANGING SECTION HEIGHT-150 CM. SOLID TIMBER THROUGHOUT. TONGUE&GROOVED BACK PANEL AND DRAWER BASE. TOP ROB SECTION AND BOTTOM DRAWER SECTION. HANGING SECTION HEIGHT-140 CM. IT CAN BE SEPARATED IN TO 2 SECTIONS. DEPTH- 60 CM. WIDTH- 119 CM. Nest of tables. 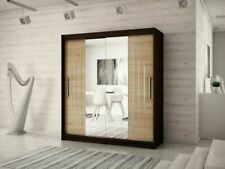 Regal Modern Oak Combination Wardrobe. We pride ourselves on bringing you the very best in Oak, Pine and Painted Furniture with an exceptional service to match. We pride ourselves in bringing you the very best in Oak, Pine and Painted furniture with an exceptional service to match. Wardrobe size :approx. - W40cm x D52cm x H187cm = (W16" x D20.5" x H73.5"). Oak / White Veneer 1 Door 2 Drawer Wardrobe. Oak Veneer Door. 2 Door 2 Drawer Wardrobe. 3 Drawer Bedside Cabinet. 3 Door 4 Drawer Wardrobe. SOLID OAK DOUBLE WARDROBE WITH 1 DEEP DRAWER & A HANGING RAIL. BEAUTIFUL SOLID OAK DOUBLE WARDROBE WITH ONE DEEP DRAWER AND A HANGING RAIL. TONGUE&GROOVED BACK PANEL AND DRAWER BASE. TOP ROB SECTION AND BOTTOM DRAWER SECTION. HANGING SECTION HEIGHT-138 CM. TOP WIDTH- 119 CM,BOTTOM BASE WIDTH; 103 CM. Wardrobe size :approx. - W40cm x D52cm x H187cm = (W16" x D20.5" x H73.5"). Matt White / Oak Veneer 1 Door 2 Drawer Wardrobe. Oak Veneer carcass. 1 Door 2 Drawer Wardrobe. 2 Door 2 Drawer Wardrobe. 3 Drawer Bedside Cabinet. Garden Storage Cabinet Cupboard Outdoor Tool Chest Lockers Shed&1/2/3/4 Shelves. ◈ Kitchen,Dinning&Bath. Our practical wardrobe presents a versatile storage solution for even the smallest bedrooms. ◈ Yard,Garden & Outdoor. Featuring Sonoma oak effect veneers and bold lines this is a classic range of living and occasional furniture. 2 Door 1 Drawer Wardrobe. DRAWER SPACE W485 D305 H130. DRAWER FRONT W535 H210. Extra Information. Cambourne 2 Door 1 Drawer Wardrobe in Light Sonoma Oak The Cambourne 2 door 1 drawer wardrobe has been expertly hand crafted from durable composite material and finished with a stunning Sonoma oak veneer. Fantastic Quality German Build. Mix & Match Listings. Accessorised with brushed steel handles, it makes an elegant choice. So know that when you choose us you can expect your item to be of the highest quality and dispatched quickly at the fairest price. Wardrobe size :approx. - W40cm x D52cm x H187cm = (W16" x D20.5" x H73.5"). 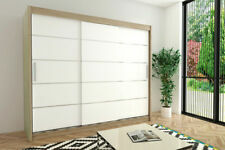 Gloss White / Oak Veneer 1 Door 2 Drawer Wardrobe. 1 Door 2 Drawer Wardrobe. 2 Door 2 Drawer Wardrobe. 3 Drawer Bedside Cabinet. Camborne 2 Door 1 Drawer Wardrobe - Oak Stain Description ---Size H185, W97.5, D55cm. ---Weight 52kg. ---Made of pine. ---1 hanging rail. ---1 shelf. ---1 drawer with metal runners. ---Metal handles. ---Handle size: L2, W1.5cm. ---Self-assembly - 2 people recommended. Delivery Please note that we deliver in UK Mainland only and it excludes Highlands, Islands and Northern Ireland if in doubt please email before purchasing as additional charges may apply. We do not ship to the following postcodes: IV, HS, KA27-28, KW, PA20-49, PA60-78, PH17-26, PH4-44, PH49-50, ZE, BT, IM, TR21-25, JE, GY, AB31-56, Orders received Monday to Friday before 12pm will usually be dispatched same day. Items ordered over the weekend will be dispatched the following working day. Return Policy We have 14 days return policy from your purchase date. The Sylvia 2 door 1 drawer wardrobe is an attractive and yet solid & Sturdy wardrobe which is set in a really lovelyLight oak effect carcass with gloss grey doors. Gloss Grey / Light Oak Effect 2 Door 1 Drawer Wardrobe. Solid Pine 1 Door Medium Hand Made Wardrobe 50 cm Wide with Shelves 5 Colors. 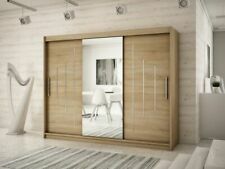 The Nadine 2 door 1 drawer wardrobe is an attractive and yet solid & Sturdy wardrobe which is set in a really lovelyLight oak effect carcass with gloss grey doors with mirror. Light oak effect carcass. Wardrobe size :approx. - W85.5cm x D53.5cm x H187cm = (W33.5" x D21" x H73"). The Lacey 2 door 1 drawer wardrobe is an attractive and yet solid & Sturdy wardrobe which is set in a really lovelylight oak effect finish. Alberta Oak 2 Door 1 Drawer Gents Double Wardrobe 95cm wide - ASSEMBLED! New for 2017 our Alberta oak collection features a clean contemporary design and is available in both a medium and light oak finish. A fantastic range which offers exceptional value and ensures choice enough for every size and style of home.